Hey! First of all, I thank you dearly for taking the time out of your day to read my blog and even go as far as to read more about me. I have been writing since I was five (about). I have yet to finish a novel, but have done significant amounts of planning and thought into all of them, 3 being the strongest. My goal is that once I finish nursing school I can continue with those plans to finish and maybe even publish. I am currently 22 and will be 23 this June. I am 23! I am obsessed with England, but have yet to go there. I WENT THERE!!!! But I want to go again. Desperately. This time, to the countryside. Please. Also would love to visit Scotland, Wales, Ireland...among many others. The world. I found out I wanted to be a nurse my Junior year of high school because a substitute teacher played a video of WWII and it showed the nurses taking care of soldiers and babies and I realized spot on that that was what I wanted to do with my life. I didn't realize however, how hard nursing school was going to be. I love music- almost any kind but I love a lot of "Indie Alternative" or Adult Alternative. In my opinion, the best therapy you can ever ask for is music/dance therapy. If I didn't have music I don't know where I'd be. I also just love to put on some "club" music and just dance or jump around like a total nut. I have always wanted to learn to play the drums. I have always had this weird desire to be a nurse for NASA one day. I am in love with the U.S. Air Force. I am still waiting for my knight in shining armor to pop onto my doorstep one day. Or bump into me with books in our hand and we both drop them and pick them up together. Or comment on how awesome each others groceries are in the grocery lane, or you know....something romantic-comedy like that. I do not claim myself to be attached to any specific religion, but I do believe in a higher power that knows whats going on and has a plan for the human race. If that is God, then so be it. I respect all religions and I think that a lot of religions believe the same thing I just said except we all call the higher power something different. I'm one of the "everything happens for a reason" people.....even bad things must happen to lead to better things. My favorite quote is, ""Everybody is a genius. But if you judge a fish by its ability to climb a tree,... it will live its whole life believing that it is stupid." I check Post Secret religiously every sunday. I still sleep with my favorite stuffed animals- Dori & Crush from Finding Nemo. Before I wanted to be a nurse, I wanted to work for Pixar, preferably a creative designer or graphic artist and create the story lines + draw characters. I still want to work for Pixar. My favorite place in the world that I have been to thus far- is Winter Park, Colorado. And, also, now Paris! I love the beach but despise the ocean. I'm petrified of the ocean. My favorite color is black, or blue. Or lavender. I want to read every book on the entire planet before I die. I love to donate blood. Please, take it all. I always have cold hands. I have "food intolerances" to tomatoes, chocolate, peanuts, dairy, wine (red wine), and anything pig-related. I made a vow 5 years ago to never eat fast food again and have kept it. Subway doesn't count. I love to fly. In airplanes. I've always thought that the perfect date would be eating ice cream (well, sorbet) sitting on a rooftop of a car watching planes take off by an airport. I used to want to be a psychologist, but now I don't know how to help people as much anymore. I am a really good listener. Most of the time. I can listen all day, but will never know what to say to you if you tell me you do not want to live on this earth anymore. I love to dance. But just random dance. Not choreographed dance. The boogey dance! I pretend that I can sing, really well. I have concerts in my shower and car only. Zero admittance. I can never ever finish a water bottle. I just can't do it. There will always be something left. Or, anything on my plate. There is always a tiny piece left of everything. I just have to. I have never been on an official picnic but, I have always wanted to. I love to ice skate. It's freeing. I usually have the short term memory span of about 5 seconds....this is pretty funny when you are talking to me. You can usually pull off some tricks over and over. No really though, I think I have dementia. Or ADHD. Or a brain tumor. I really do have adhd though, i'm kind of worse than a child. I am an official hypochondriac. Like really bad. I think I am dying from something different at least once a week. See above. Seeing places in movies that I have been too or know of or can go to makes me really, really, really, really happy. I am a complete sucker for sunrises and sunsets and If I see a good one I WILL pull the car over at any cost and start taking pictures. I've pulled the car over in some very strange locations. I will always try to get to get to the bottom of a rainbow. I love to kiss in the rain. Typical, sorry. Thank you for reading, please leave any comment saying Hello! I love to read comments! I happen to read your blog and i really find it interesting and with good information.Im also a nurse and currently working in Riyadh,KSA.Im now working also in devolving a nursing website wherein you can find the latest news,information and articles,also a site wherein nurses can interact and voice in their opinions. 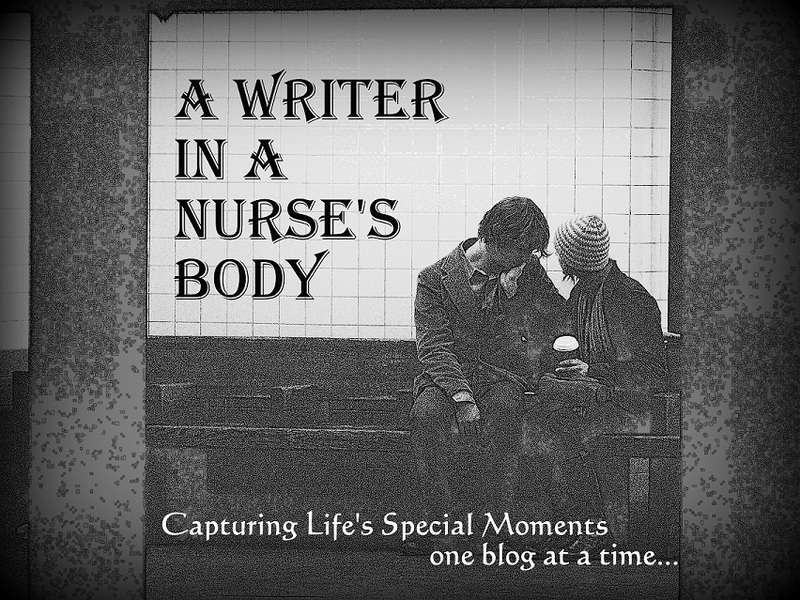 I would like to ask if you are interested that your blogs will be featured in our website in one of our section there that features blogs for the nurses. i am preparing for NCLEX. suggest me any nursing career abroad..